OK well here is my wedding report, please don't look at my spelling or anything like that!! The Thursday before the wedding it snowed, it was beautiful to look at. But when I woke up at 3.45am on Friday morning - I couldn't sleep I was far too excited, I went down stairs and watched The Grinch, and looked at the snow falling, I didn't think anything of it. But when Steve got up he had a panic attack, saying I don't know what we are going to do. There wasn't anything I could do I had planned it so much that I couldn't control the weather. So on the Friday I had it planned that we would go to the venue to drop off the table decorations. So we packed the car up, and set out for Maidstone. For us to be stranded on the M20 for 4 hours. At this point it was still snowing, I had Steve telling me that he was worried, and I was trying to be a brave girl and say "It will all be ok". But I wish I had turned my phone off. I had family members calling telling me they didn't want to come out in the snow. The vintage car I had, called and said they wouldn't come in the snow, the Harpest didn't want to carry the harp in the weather incase it got broken. It wasn't going well. We dropped everything off at the venue, and went to make our way home. At that point I had to turn my phone off I couldn't take any more, I was in tears the day before the wedding, getting stuck on the way home, we knew we couldn't ask people to come to Maidstone with the weather this bad, there would be accidents. We were going to call off the wedding reception, and plan it again. It was hard to say it out loud, but there was no way people were going to make it there. We got home to talk to our parents about it all. They told us not to be silly, that it would be fine, and that if it doesn't snow Friday night it will all go ahead fine. So I booked another car, to take us, just in case, I sorted out a CD for the venue and we went for our rehersal at the church. This was the most magical thing I have done, we had the rehersal with our friends and family, It made me so nervous, and it also made me feel that nothing else matters, I was going to say my vows, I was going to marry the man of my dreams and the rest can or can not happen. It didn't matter. So Steve came back to the house with me, my sister, and one of my bridesmaids. He got all his stuff sorted, and then went to stay at his friends. I went to my aunts, we all live in a little village in Kent, so all my mum's brothers and sisters went there for dinner. It was great the night before to have them there. THE BIG DAY 19TH DECEMBER 2009. Its the most surreal thing getting ready. I slept like a log, After dinner with my very large family, I came home watched Father of the Bride, and fell asleep, hoping the snow would keep away. I got woken up by my Best friend, She was in the room with me, and said that the alarm had gone off, and that I had to get up!! My Hair dresser Mel turned up and Jackie my make up girl, so I knew that you could get in and out of the village. There were banners all over the house, and ballons, with Congratulations on your wedding day out side. The girls all got there make up and hair done, I don't have any pic of me getting it done yet, as I don't have any pic off the phototgrapher Darren, so I will show you the ones of my Bridesmaids, you will see that we were Gok, I think we needed him. So here are some pic of them. I had my dad phone the car they said they could pick me up from a local Toby Carvery, So my car that I had booked took my bridesmaids. So I am trying to write this but I can't do it that well due to the bloody Adverts, I am not so good at this. So here is some of me putting on my dress and my Bridesmaids. So they put the dress on me and then we went off to the church. I am trying to put the pic on but I am not doing it correctly. So I am trying. So after nearly falling over 100 times. I decided that it was my wedding day and its beautiful snow, how many people get that! So I was lucky, and if people can't make it, then it doesn't matter as long as Steve is there, it will be fine. I got told by my sister that he was at the church. She was checking that they were all on time. So I got the the Church, and I was freezing the car said it was -3, I mean come on, give a girl a break. So after having a few pic with my dad we walked to the church, the one thing I will remember from this moment is that the church is right next to a round about with a large duck pond on and people driving around it, were beeping and shouting congrats, it was really fun!. The girls were waiting for me at the door, and the Vicar told me that I looked gorgeous, I held on to my dad, and we walked in. I was crying as we walked up, and I made sure we walked really slow, I didn't take my eyes off Steve, he was crying too. When we got to the end, I just had to look at how gorgeous he looked. I couldn't take the smile off my face, which everyone told me about after. Steve was crying while saying his vows, which made a lot of people cry in the church. It was just the most amazing time of my life. It something I will never forget, and the best part of my day, anything could happen after, I didn't care. So here is us outside the church. Because I am having trouble with putting pic on I will just try and do a report with lots of photos. My report doesn't look as pretty as other peoples! So we had to leave the church early I didn't get all the photos that I wanted, as I was freezing so we drove over to Maidstone, we were the first ones at our wedding reception which was the biggest surprise, the roads were clear so we were lucky. Someone was smiling down on us letting it go so well. When we got there we had a chat with a few people, had a glass of bubbly, then we went and had our photos done. The venue the Turkey Mill is so beautiul it has a river and waterfalls, so I can't wait to see the photos. At this point I wanted to say how fantastic our photographer was Darren, he ran around in the snow getting cold and wet and didn't complain once. There were a lot of people missing from the wedding reception, but we still had enough people there. I think it was hard for us both knowing that family couldn't be there because of snow. Our best man speech was fantastic, it was the best we have ever heard and there were people crying with laughter. Which really kicked the evening off. It was at that point that our DJ turned up, Steve went to check that he was ok, and then he came back with the bad news!, he didn't have the song for our first dance, yeah the one song I have told him about the whole bloody year. So I made a few phone calls to the girls from work who were coming in the evening and one of them downloaded it and brought it with them. 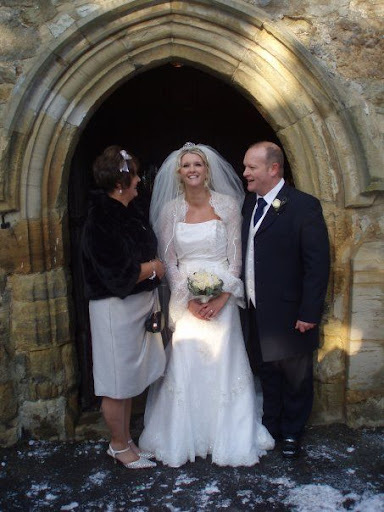 I was a bit annoyed with him, as I was doing his job on our wedding day, but I was told by our wedding planner at the Turkey Mill that I was very calme, so least it didn't come across. I loved having the evening guests turning up, the venue is really hidden and you don't expect what you are going to see when you walk in, so it was great to see their faces. We had a good dance, then we were told that we had to cut the cake, me and Steve had a giggle at this point as we didn't know if we actually cut it. Then we had our first dance to Dice, by Finley Quay. It was a bubble moment, and we didn't think about anyone around us. Then our DJ played Chasing Cars by snow patrol and all our friends jumped on us, and cuddled us, we all sang it really loud, it was a song that will stand out for me. Then everyone got on the dance floor. There was a lot of drinking going on, and we have a lot of funny stories coming from the night. It was just fantastic. I have missed bits out, but I want to keep them to myself, for my own secrets of what I loved. Just enjoy the day, for me it didn't go too fast but we got married at 11.30, so it was a long day. Take a moment to yourself, for your own snap shots.